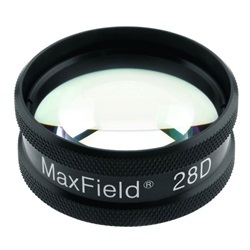 Excellent lens for use during pediatric examinations. Lens is black with a static field of view of 58 degrees, image magnification of 2.11x, a laser spot of 0.47x, and a clear aperture of 38mm. Weighs 39g and has a working distance of 27mm. Manufactured by Ocular.